Dwarf Red Bulborbs (アカコチャッピー?, lit. : "Child Red Chappy") are small and common enemies in the Pikmin games. They were originally known as Dwarf Bulborbs (小チャッピー?, lit. : "Small Chappy") in Pikmin until various subspecies with different colorations were discovered; they are called just that in Pikmin 3 as well. 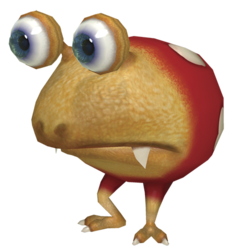 At the end of Pikmin it is known that they are not of the same species as the Spotty Bulborb, and in Pikmin 2, they are revealed to belong to the Breadbug family, not the Grub-dog family. These enemies perfectly resemble Red Bulborbs in appearance, but are much smaller. Dwarf Red Bulborbs can be easily defeated by swarming them, or by throwing a single Pikmin directly on top of them. In Pikmin 2, if a leader throws a Purple Pikmin on it, it will remain attached while the creature falls. In the first game, bothering one will make it release a loud scream, waking up the nearest Spotty Bulborb. Dwarf bulborbs do scream in Pikmin 2, when a Pikmin is thrown onto its back, but the scream does absolutely nothing. They squeal when a leader or Pikmin bothers them in the second game, as do the other Dwarf Bulborbs and Dwarf Bulbears. If this creature is petrified in the Piklopedia, when it breaks out of the stone it runs around eating any thrown Pikpik carrots at a much greater speed than normal. In the Cavern of Chaos, on sublevel 8, more than fifty of them can be found, along with two Gatling Groinks. Dwarf Bulborbs have a far deeper-pitched cry in Pikmin 3. They no longer shriek loudly as they did in Pikmin 2 when killed, but instead emit a deep, throaty sound much like the Red Bulborbs in Pikmin 3 do. This change seems questionable, as their smaller larynx should indeed produce a higher-pitched sound than that of a Red Bulborb, as seen with Bulborb Larva. By the end of the first game, it is revealed that the Dwarf Red Bulborb is actually a completely different species from the Red Bulborb. As such, one could most likely assume that these creatures are masters of mimicry. Like the Red Bulborb, they have a very mammalian appearance, sporting the soft, leathery skin and bulbous eyes of their pseudo-cousin. They also have the same spot patterns and "mandibles" as that of the Red Bulborb. In Pikmin 3, the spots are larger and these spots are indented. However, they do have one notable difference; these look-alikes have black eyes while Red Bulborbs have purple eyes. "The trickiest aspect of fighting Dwarf Red Bulborbs is that they travel in groups. When you attack one, the others will help defend it. Attack each little Bulborb with a toss. If your throws are accurate, you'll flatten the lot of them in a hurry." "Dwarf Bulborbs are much weaker than their fully grown counterparts. To quickly defeat a Dwarf Bulborb, toss a single Pikmin onto the creature’s back." If you have a large group of Pikmin available, you can simply swarm it. Alternatively, aim and throw a bunch of Pikmin at its back. If a Pikmin lands directly on top of it, it will die instantly. In the first Pikmin game, these creatures may cause the crushing glitch to occur. In Pikmin 2, Purple Pikmin will home in on the Dwarf Bulborb, which can be pretty helpful for a quick kill. The Purple Pikmin will take a while to get off of the Dwarf Bulborb it landed on, but cannot be eaten while still clinging to the creature. If a Pikmin is caught by one, then it can easily be saved by throwing another Pikmin onto the creature's back. As the enemy dies, any captured Pikmin will be released from its mouth. Simply punching while avoiding its attacks is the most effective strategy for leaders. Japanese name: ベニデメマダラモドキ?, lit. : "Pseudo Spotted Crimson Bug-eye"
See more: Breadbug family#Naming and Red Bulborb#Naming. The creature is called as such because it is a dwarf-sized mimic of a Red Bulborb. In Pikmin, the only "Bulborb-like" creatures were this and the Red Bulborb, so there was no need to disambiguate its name with a color. Hence, it was just called "Dwarf Bulborb" in the first game. Pikmin 2 introduced other species, so disambiguation was needed, but Pikmin 3 went back to calling it Dwarf Bulborb, even though multiple types of Bulborb and mimics still exist in that game. In Japanese, it is called アカコチャッピー?, which translates to "Small/Young Red Chappy", referring to its small size. The scientific name for the Dwarf Red Bulborb is Pansarus pseudooculii russus. Pansarus pseudooculii is the species name used for other Breadbug mimics, and russus reflects the subspecies name for the Red Bulborb. In the versions of Pikmin 2 before the European Wii release, the word pseudooculii is written with only one 'o', which is presumably a mistake, since all other dwarf mimics use two 'o's. Internally, it is called chappy in Pikmin, meaning this enemy was likely the original Bulborb during development (チャッピー? is the Japanese name for "Bulborb"). In Pikmin 2, it was changed to reflect its normal name, and so it was named kochappy. This is its internal name in Pikmin 3 as well. In an early script left inside Pikmin 2, it is revealed that is placeholder scientific name was Pansarus Psuedooculii RED. Not only is the word "RED" a placeholder, much like in the early scientific name of the Red Bulborb, but "pseudo" is also misspelled. Red Pikmin fighting two Dwarf Red Bulborbs. A Dwarf Red Bulborb in the Piklopedia from Pikmin 2. A Dwarf Red Bulborb locked-on in an E3 2012 build of Pikmin 3. A Dwarf Bulborb in Pikmin 3, about to eat a Red Pikmin. Dwarf Red Bulborbs around a Red Bulborb in Pikmin 3. A close up of a Dwarf Bulborb. A Dwarf Red Bulborb on the enemy reel in Pikmin. A large group of Dwarf Red Bulborbs as seen in an earlier version of Pikmin. Artwork of a group of Dwarf Red Bulborbs from Pikmin. The creature's e-card, #04 (3rd red card). This page was last edited on April 19, 2019, at 08:43.